In 1925, Fernando Pessoa, the famous Portuguese poet, wrote a tourist guide about the city of Lisbon, Portugal. Through his guide he hoped to inform the world about the marvels of his favourite city. Philippe Gambette has lovingly created a web version of the guide (with the complete text) that uses the Google Maps API to show all the locations mentioned in the guide. 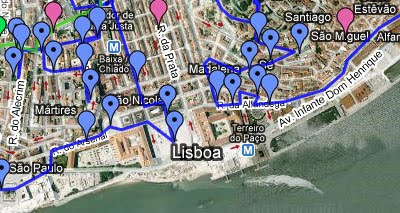 Or find this illustrator city on a Free vector map Spain + Portugal, Adobe Illustrator, download now maps vector clipart. Phillipe has created versions of the guide with photographs (text with pictures), an interactive book (text with Google Maps links) and a Google Map that shows all the locations mentioned in the guide. The interactive book has hyperlinks for all the locations, that when clicked load a Google Map showing the location. The Google Map version contains links that take the user to the relevant text in the guide. Phillipe has also blogged about how he created this project which is available in English and in French.